If you are short on time but you still want to find what the best power wheelchair is, we have you covered. We have inspected the market and read the most popular power wheelchairs reviews to help us identify the model that offers high-quality and a good value for the money. We have concluded that the product you’d be smart to consider is the Foldawheel PW-1000XL. It is a lightweight device that weighs only 57 lbs, and for a heavy duty model built to offer outstanding performance, this factor is quite exceptional. It can fold and open in just 2 seconds, and it can be transported easily even in a small car trunk. This might be a powerful machine, but the quiet brushless motor will keep it running as quiet as a mouse. If by any unfortunate event you are unable to find this model available for sale, we recommend you bear the Drive Medical 4 Wheel in mind as your second alternative. With specs only top-rated products feature, this model is committed to helping you regain independence and reach different places with ease. The heavy-duty portable chair has a weight capacity of up to 330 pounds and can speed up to 5 mph. Comfort is ensured by the 18-inch seat cushion and the material used. The unit offers a silent operation and ease of use thanks to the 3-joystick controller. Check the product dimensions as one buyer found it to be not wide enough. Lightweight and easy to use, this chair will help you move around comfortably and silently. If stability and comfort are the benefits you want to enjoy, this product should not be ignored. The wheelchair promises to handle any road and deliver stability even on outdoor rough terrains. It can reach 4.25 mph and the EXT batteries allow it to run 9 miles. The unit has a weight capacity of 300 pounds and a 16.5-inch seat. Enhanced comfort and ease of driving are also ensured. The wheelchair might be a bit heavy for some users. Check its weight. Consider this product if you want to move around and reach your favorite store with ease. 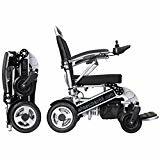 Lightweight and compact, this wheelchair won’t just help you explore the neighborhood or reach a store with ease but will also make it easy for you to add it to your travel gear when on vacation. It can be easily and quickly disassembled into five pieces and loaded into a car or truck. The unit is ideal for people with limited dexterity as it comes with a delta-style tiller that is easily adjustable. The unit proved to be too small for some users. Check the item dimensions. Reach various places and explore your surroundings easily and comfortably if you go for this chair. Doing your own research is an essential first step but even then, trying to compare all the available options to find the best power wheelchair for outdoor use is a tough process. We understand just how difficult it can be to select a good power wheelchair to meet all your demands which is why we have picked some of the top-rated models available today. The main characteristic of the Foldawheel model is the fact that it weighs only 57 lbs and that makes it an excellent folding power wheelchair that you’ll be capable of transporting and storing with great ease. If you have concerns due to the weight capacity, travel weight, or body size, and you want a faster speed, this is the model for you. Indeed, despite the lightweight design, this is a heavy-duty portable chair designed to handle a weight capacity of up to 330lbs. What’s more, it can also speed up to 5 miles per hour no matter the weight that it carries. You also get ample room with the 18-inch seat cushion, especially as the sides are open. Another improvement of this model is the fact that it manages to pack more power without inconveniencing the user. The brushless motor with solid rubberized rear tires is quiet even when driving at full speed. The size of the tires also feels right; they are big enough to be able to do their job but not so big that they become bulky. Controlling the chair is also easier than ever as the updated version 3-joystick controller is intuitive and extremely precise. If you’re looking for a great granddad gift but you are on a tight budget, and you still want to make a quality purchase, this product is a great choice. The 4 Wheel from Drive Medical is a lightweight model that provides outstanding stability even on the rough outdoor terrain. This is a genuine off-road power wheelchair that can handle any road. It is powered by a pair of EXT batteries that give it enough juice to reach a maximum range of 9 miles. The motor runs at an impressive 4700 rotations per minute allowing it to reach a maximum speed of 4.25 miles per hour. The seat width is of 16.5 inches, and it can handle a total weight capacity of 300 lbs. When the handy walking stick is no longer enough, the comfort that this unit offers will be a life changer for your granddad. The adjustable padded swivel seat backrest and armrests will give him an unmatched level of comfort and allow him to move just as he did before. The delta-shaped steering handle will make driving an effortless task, even if the person driving lacks dexterity. As a plus, the non-marking, anti-tip wheels will help increase the stability of this unit. The 3 Wheel model is another affordable option from Drive Medical that is built to cater to the needs of elderly people that can no longer make use of their high-quality senior walkers. This transportable scooter combines the easy and convenient mobility you would expect from a premium power wheelchair with superior value for the money. This model is lightweight, compact, and extremely easy to disassemble, making it perfect to take with you when you want to travel around the neighborhood or far away from home. If you’re going to transport it and take it with you on vacations, it can be disassembled quickly into five pieces that are easy to handle and load into a car, van, or truck. The three-wheel design makes this unit even more compact with the added advantage of allowing you to navigate through indoor obstacles nimbly. There are also other notable features such as the quick connect battery pack that can be charged separately from the scooter and the delta-style tiller ideal for people with limited dexterity or strength. All these nifty features make the Drive Medical 3 Wheel an excellent gift for grandparents, and judging by the user reviews, we are not the only ones that think that. If money is not a problem and you want a premium model that can gift you the features of more devices into a single one, the Karman XO-505 was built for you. Just as a quality Hoyer lift, this fully powered standing wheelchair will be able to transport the user to any place comfortably and efficiently. Indeed, this chair is perfect for both indoor and outdoor use; the mid-wheel drive is designed to enable the wheelchair to have an improved center of gravity, while the front and rear wheels create the ideal balance for the user while on changing surfaces. The frame is built from 6061 T-6 Aircraft-grade Aluminum which gives it incredible durability with little costs when it comes to the weight of the chair. The full control LCD display makes this device very easy to use as all the information you need is presented in an intuitive and user-friendly manner, and all the functions are at the tip of a finger. You can scroll through the driving speed, drive control, and function selection quickly. The sit-to-stand function can be switched in under 15 seconds, and the standing setting can be adjusted at any angle that you desire. The Sunrunner Three Wheel is a mid-size scooter that can handle a weight capacity of 300lb. It is the perfect way for an elder to go shopping as you also get a headlight package that offers enough capacity to store all the items you’ve just bought. This particular shopping basket is built with durability in mind which is why it features a quality plastic construction. The standard unit comes equipped with a deluxe captain’s seat that is built to accommodate most users. The tiller is adjustable for added comfort, and the front head light will enable you to use this scooter even in the evening. It is available with a full lighting package with hazard lights and turn indicators. The 3-inch ground clearance will allow you to operate this unit on multiple terrains. If you want to go off-road, nothing will stop you as even the rugged terrain poses no difficulty for the Sunrunner. The side and swivel seat will make it easier for you to get on, especially for the seniors that lack strength. Using the device is easy, and that becomes even more evident when you take a look at the overwhelmingly positive reviews and the pleasant experience of the buyers with this unit. The DST 4-Wheel model is an affordable unit built to cater to the needs of seniors that want an easy-to-use power wheelchair that can take them where their feet are not capable to anymore. The Dynamic Suspension Technology features rear and front suspensions coils that allow for a comfortable ride regardless of the terrain. The fact that you can take this unit off-road without having to lower your expectations in terms of performance is something that both we, and the many customers that have tried it, were impressed by. You can also use it during the evenings as the powerful headlight will make sure that the road ahead is always adequately illuminated. It features a powerful motor that runs at 270W and 4700RPM which translates into a maximum speed of 4.25 mph. You can reach an estimated range of 15 miles with a single charge and you won’t have to worry about the charging process being difficult as the Drive Medical alternative is intuitive and easy to use. The charge port is located on the control panel and allows for easy charging. The armrests are padded and contoured, and their width and angle can be adjusted to a vast array of body types. If portability is on your mind, the Cirrus Plus is a foldable and lightweight chair that makes it ideal to transport and take with you no matter where you go. For people that travel a lot or that simply want to be prepared for anything, this is an excellent choice. It comes in a carbon steel frame with a silver vein finish which makes it quite attractive. The power wheelchair comes standard with a seat cushion with a pouch for easy storage, and a seat belt to keep you safe. Adjustability is another key feature of this unit which is why the length of the joystick mount, the tension back upholstery, the height flip back, and detachable arms can all be customized to your liking. The two 4600 rpm motors help this unit achieve a top speed of 5 mph, and it has a maximum range of 15 miles per charge. The two pairs of U1 batteries are easily rechargeable so that you never run out of juice. In terms of weight capacity, it can safely hold a person that weighs up to 300 lbs. The integrated and programmable PG controller is easy to use even by a person that has never used such a controller, making using the chair a simple task that comes naturally. The Compact Mid-Wheel Drive is a luxury power wheelchair that comes at a reasonable price for the features it offers. It has a 19 inches mid-back seat with adjustable mid-back seat, headrests, and armrests. The all-new body style is built to be more aesthetically pleasing by concealing the suspensions, a thing which creates a more streamlined profile. That doesn’t mean that style is everything this unit has going as the ten-inch drive wheels can reach a max speed of 4 mph, and the fully suspended front anti-tip wheels will ensure your safety. You will be able to go to places that seem unsafe with other models, and you may even go off-road. The footplate is extended, and it has three levels of angle adjustments so that you can get the comfort you need for an amazing experience every time. The product weight is of 206.1 lbs, and it can handle a maximum weight capacity of 300 lbs. Both the batteries and the charger are included in the package, and the unit can drive 14 miles on a single charge. The charger is also built-in which helps remove one worry as you’ll no longer need to fear that the charger gets misplaced and you are unable to charge the batteries. Finding the right wheelchair takes time, there are so many models available on the market that offer unique sets of features that going through each one is simply impossible. Still, a decision needs to be made, and the best way to go about things is to educate yourself and do your own research to help narrow down your searches. We understand that your time is precious which is why we have done the homework for you. We have read consumer reports, surveys, and many other specialized resources to identify the key features you need to focus on. If you want to find a cheap power wheelchair, our buyer’s guide is a good place to start. A proper power wheelchair is an excellent purchase for grandparents of any age, and it is just as essential for keeping them safe as a good senior cell phone. You don’t want to subject them to stresses that their frail bodies can no longer handle, and the good thing is that you can now find high-quality models for a fraction of what they used to cost. Before you go and make a purchase, you need to know what kind of model you require. Do you plan to use the chair only outdoors, indoors, or maybe both? While most models nowadays allow for both indoor and outdoor use, some specialized units can only be used in only one of these settings. If you want to transport the wheelchair in trains, cars, SUVs, planes, or cruise ships, you will have to make sure you go for highly portable options. These can be easily identified; if they are foldable or can be disassembled into smaller pieces, you should get them. Of course, they must also be lightweight. You should also consider the distance that the chair needs to traverse. All models will have a specified maximum range, and if you travel a lot in a single day, you should get the model that has the range you require. The battery is one of the most important parts of your new powered wheelchair as it is the primary power source and it needs to be chosen carefully. Some batteries require more maintenance than others. If you feel like you are not capable of keeping up with maintaining the battery, we recommend you choose an option that is less demanding. The Gel and AGM batteries require no maintenance. The AGM is shock-resistant, leak-proof, and approved for air travel. The downside is that it is the most expensive battery available, but it makes up for it with its convenience. The Gel batteries have a longer life cycle than the wet alternatives, and they cannot leak, which is a big plus. They are also approved for air travel. The wet batteries are the cheaper version, they weigh less but do require maintenance. The wet version is prone to leaking, and it is not approved for airline travel. Finally, there is the Lithium-Ion alternative, the type you are probably most familiar with by now. It uses the same technology you’ll find in any modern smartphone, laptop, or tablet batteries. This type of battery is probably the best choice you can make as it can store up to 6 times the energy of other types, and it is also environmentally friendly. On an average day, seniors can spend one or two hours in their new wheelchair so unless one chooses a comfortable model, one could end up regretting the purchase. A quality wheelchair cushion is paramount and so are the armrests. You might find it hard to believe, but the armrests are crucial parts of any wheelchair and pieces that are often taken for granted. The armrests should be sturdy and comfortable enough to provide the user with stability and support. Many seniors will not use the armrests only to rest their arms comfortably, but also for a wide variety of things. They can give them proper stability to reach for things, or maybe pick something from the floor that they’ve just dropped. Finding the right position in the chair is also aided by armrests, and they can help relieve the spine and intervertebral discs from pressure. With so many benefits that come from choosing the right armrest style, we hope you’ll put more thought into this mundane yet essential part of the power wheelchair. While there some options that use a steering handle to control the device, most manufacturers use joysticks as they are much easier to use by seniors that have lost most of their dexterity and strength. There are two types of controllers on the market today, the modular and the integral controller. The modular controller has separate components for a variety of functions and elements while the integral one has everything in one housing with the joystick. The integral controller is less expensive. The good thing is that some wheelchairs allow the replacement of the controller with whatever the user finds most beneficial.